Stories like the one below began creeping up at social media posts a few days ago. It seemed like a stunning piece of news, this banning of after work e-mails. But it seemed plausible. It was the French, after all, that was supposed to be putting the ban in place and we know that the French can be rather unorthodox, especially when it comes to labor regulations and a disregard to what others might regard as essential business practices. France bans work e-mail after 6 p.m.
France already has a 35-hour work week, and a new rule is designed to make sure that it doesn’t start shading toward 40 hours because of work-related e-mail.The Guardian reports that the rule forbids workers from checking their phones or computers for work stuff after 6 p.m., and it forbids employers from pressuring them to do so. That was, however, not the most interesting aspect of this so-called piece of news. The reactions over social media, especially Facebook, are. You have people gleefully posting stories similar to this and making silly remarks like, “Can’t wait for this to catch up in this country,” or “At last, I can get out of the clutches of my bosses,” or other remarks in a similar vein. The message that these people were sending out was that anything that reduces my commitment to work outside of what’s stipulated is good. I’d just like to get paid, do what I have to and not want to worry about the company I work for. This sounds reasonably transactional, except that the reality of life and work is vastly different. As an employer I’d expect my employees to treat the company’s fortunes as their own rather than embracing a mentality that a friend has dubbed OPM – Other People’s Money. “That’s because the organization is funded by donors, the government or other sources and so long as you can justify that you did whatever you had to do, your continued employment, even promotion, is guaranteed. There is no such thing as the organisation saying to them we’ll have to lay you off, lower your salaries or take away your benefits because we have not been innovative enough. This is not the case in private companies, where we sink or swim, depending on how well we perform, not over the past decade or months but every day. The moment we slack off, the moment when we stop trying to innovate is the moment we slip into decline and a client may fire us, serve us a warning or tell others to go elsewhere. As such apart from technical excellence and being good at doing what they do, we private sector guys also demand that the employee view their employment fates as inevitably tied with ours. If they see something wrong they should bring it up, if they see something that can be improved they should set about doing so and if we need to change they should speak up. In return we try to make their working hours as reasonable as possible, to bother them outside working hours only when it is essential and that they take a proactive part in “owning” the business. That is the only way we know on how to run a business. To expect a strict transactional relationship to exist between employees and management is, to our view, unreasonable and immature. 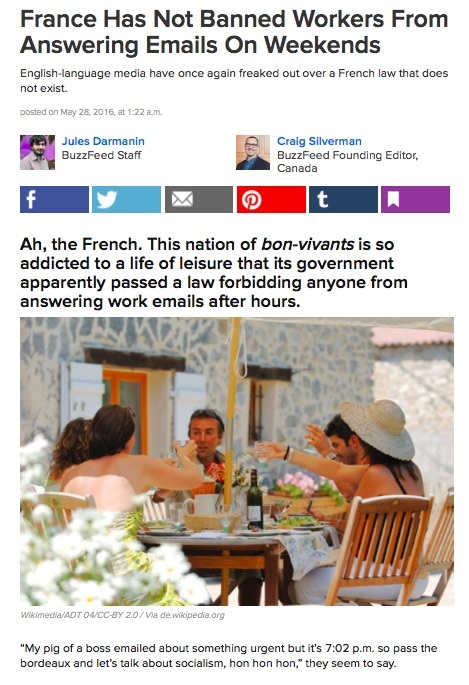 Fortunately, even the French are not so crazy to slap a blanket bank on after-work emails. It turns out that, like so many other things, social media is a great amplifier of popular but wrong information especially when it is on a popular subject. So the real story is that The French have not banned anything. They are only considering some restrictions. And the restrictions are not blanket but subject to some conditions to be agreed between workers and employers. So what the hell are you doing reading this blogpost during or after your working hours? Go back to work!